Mars, the “Red Planet”, is visible to the naked eye. Known even by the Egyptian astronomers since 1534 B.C., it has always called us from among the stars, awakening our desire to visit. In fact, when the telescope became available, the first step towards the knowledge of Mars was made in 1672 by Giovanni Domenico Cassini, an Italian/French mathematician, astronomer, astrologer and engineer, who succeeded in measuring the diurnal parallax of Mars, to determine the Sun-Earth distance. His observations and astronomical discoveries were so remarkable that recently his name has been given to the asteroid “(24101) Cassini”, to Lunar and Martian craters, and to the Cassini–Huygens probe. Mars thus started to be considered as a “terrestrial planet” with valleys, deserts and polar ice caps wrapped inside a thin atmosphere, and a rotational period with seasonal cycles similar to Earth. The second step towards discovering more about the Red Planet was made in Milan, on 6th February 1760, by two Jesuits who were teaching to the clergy and nobles classical and scientific studies at the Brera University. Despite being professors of philosophy, they were astronomy fans and discovered a comet with their naked eye, following its passage with their telescope. At this news, the Milanese were really excited and convinced the University to build a proper astronomic observatory, calling on Milan Giuseppe Lodovico Lagrangia, a famous Jesuit astronomer at that time working in Marseilles. The “Osservatorio Astronomico di Brera” was then built in 1764 in collaboration with a further fourth Jesuit, Ruggero Boscovich (in Croatian Ruđer Josip Bošković), a typical eighteenth-century figure of cosmopolitan intellect who was a physicist, astronomer, mathematician, philosopher, diplomat, poet and theologian. His father, a Ragusan merchant, died when he was a child so his Italian mother sent him in Italy. Here he studied, lived and worked for most of his life, excluding a period of 10 years in France, and some works carried out in various capitals, including Warsaw, London, Vienna and Constantinople. 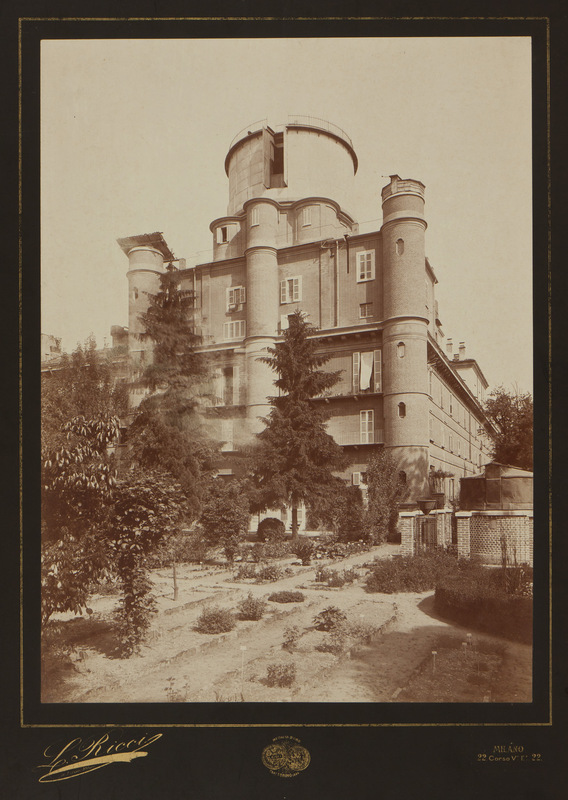 To build the Observatory, he modified the Brera Palace adding a tower with a terraced roof with four small conical domes to accommodate observational instruments. The considerable cost was funded by the University, by the scientific patronage of volunteers, including several Jesuits, and partly by Boscovich himself. Following the suppression of the Jesuit order (see our Hello Milano issue on May 2017, https://www.hellomilano.it/hm/visit-brera-strolling-through-the-centuries/), Brera Palace passed to the rulers of the Austrian Habsburg dynasty who continued to sustain the Observatory. After the proclamation of the Kingdom of Italy, on 17 March 1861, the Astronomical Observatory of Brera was given new life under the great work held by Giovanni Virginio Schiaparelli. He studied at the University of Turin, and later at Berlin Observatory, under Johann Franz Encke. He then worked in the Pulkovo Observatory near St. Petersburg, and finally arrived in Milan in 1882, where for over forty years, he was the director of the Brera Observatory. Here in Milan he had at his disposal a quite good Merz telescope produced in Germany, but Schiaparelli strongly requested the purchase of one of the largest and most powerful telescope in Europe, the Merz-Repsold. The huge investment of 250,000 lire (more than 1 million € today) was approved despite the country’s economic difficulties due to the recent reunification, but made the Milan Observatory one of the most advanced in the world to deepen Mars studies. Constructed by Merz (the optical part) and Repsold (the structure), had an objective lens of 49 centimeters in diameter (no longer present), a focal length of 7 meters, a support column of about 5 meters high, and a total weight of around 7 tons. This instrument granted a precise and detailed observation of the sky, marking a turning point in the study of planets. 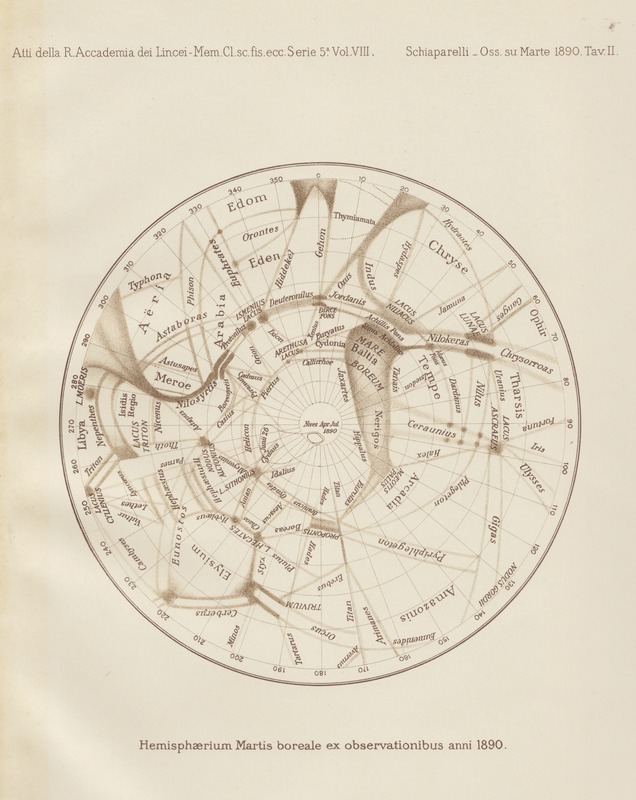 It allowed Schiaparelli to design several Mars maps showing the presence of “channels”, which gave rise to a heated debate among scientists on the existence of water, vegetation and even intelligent life on the planet. While Schiaparelli remained cautious in hypothesizing what could have been Mars nature, other astronomers engaged in debates which went far beyond the scientific sphere to invade sociology and costume, indissolubly linked to the myth of the Martians and the new lucky science fiction! Only many years later, scientists realized that the details of the Mars surface were the result of an optical illusion. Schiaparelli was in fact a victim of a well-known perceptual phenomenon according to which the human brain tends to give a geometric structure to details grabbed by the eye in a vague and indistinct way. 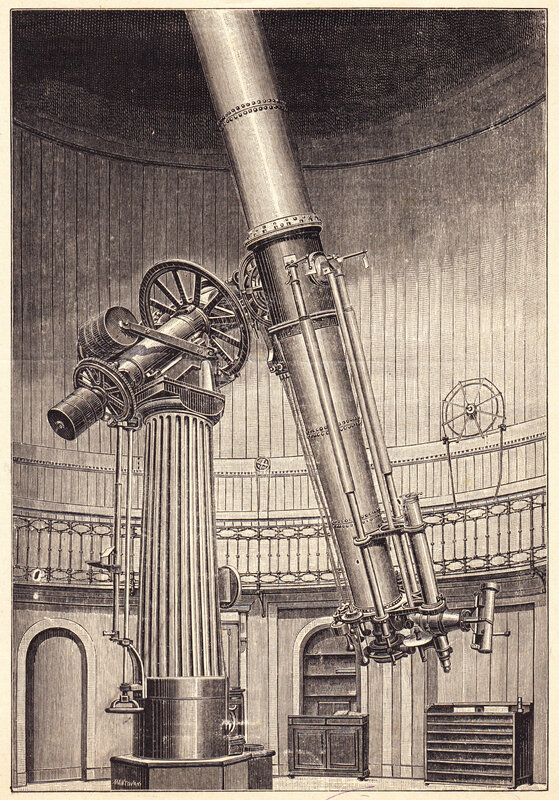 Schiapparelli died in 1910, in 1936, the Merz-Repsold telescope was transferred to the new and more modern Observatory in Merate, and then sadly dismantled in the early 1960s. But recently, on the occasion of the centenary of Schiaparelli’s death, the Astronomical Observatory of Brera launched a project for its restoration, made possible by a funding approved by the Chamber of Deputies, and further supported by contributions from other public and private sources. Its complex restoration was recently worked out by the voluntaries of ARASS – Brera (Association for the Restoration of the Ancient Scientific Instruments Onlus). After an historical research, they have reproduced the missing parts in agreement with the Metropolitan City of Milan’s Superintendence of Archeology, Fine Arts and Landscape. Born to a new life, the telescope is now part of the highlights kept inside the Space and Astronomy sector of the Museo Nazionale della Scienza e della Tecnologia in Milan, in addition to the important collection present at the Museum since 1961 when, following the celebrations for the 50th anniversary of Schiaparelli’s death, some of the most valuable historical Brera instruments were donated to the Museum. Let us end this article recalling the NASA Mariner Program conducted from 1962 to 1973 to investigate Mars, Venus and Mercury. It was the starting point for many subsequent NASA/JPL, such as the Voyager, or the Viking, Mariner-based spacecraft included the Magellan probe, the Galileo probe, and the Cassini–Huygens probe. After so many centuries, now we are quite sure that Mars is really different from Earth, non-existent Martians will never land on our planet, and for us it will difficult to live there, as even taking a shower would be pretty hard!